A marvelous spread of sail. 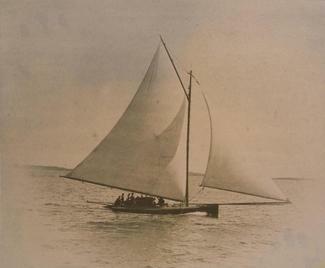 Boats like Annie, called sandbaggers, were the extreme sailboats of their day. Like most sandbaggers, Annie‘s sail plan was twice as long as her 28-foot hull. These wide, shallow boats needed crews of more than 10 to handle their huge sails and shift the 50-pound bags of sand ballast that helped keep the boats upright and gave them their name. Because they were so shallow, sandbaggers had a large centerboard, which could be lowered to prevent the boat from sideslipping downwind. Annie was launched in 1880 for Henry H. Tift of Mystic and Tifton, Georgia. Tift raced his sandbagger in Georgia and Florida during the winter and often brought her north in summer for highly competitive races in Long Island Sound. From the 1860s to the 1890s, sandbagger racing was a very popular sport from New York to New Orleans to San Francisco. These races mixed working watermen, amateur sailors, and crowds of spectators, most of whom bet on the winners of match races. With few rules, sandbagger racing was exciting, but it died out in the 1890s after yacht clubs developed “Corinthian”-amateur-regulations and measurement rules for handicapping racing yachts. Annie was built about half a mile down the Mystic River by the prominent boatbuilder David O. Richmond (1825-1908). At his two-story boatshop, Richmond built a variety of boats and highly regarded yachts. After her launch in 1880, Annie came back to Richmond’s shop for changes in 1886. In 1902 Richmond rebuilt her after chimney sparks set the shop ablaze and damaged her. D.O. 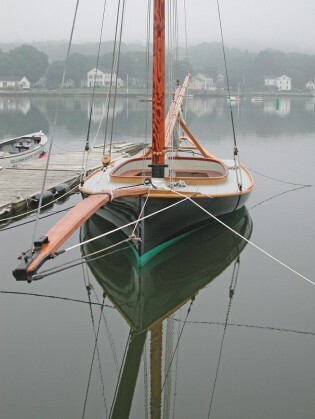 Richmond ran a successful boatbuilding business for more than 50 years, and even in his later years he enjoyed sailing with friends in the boats he built. 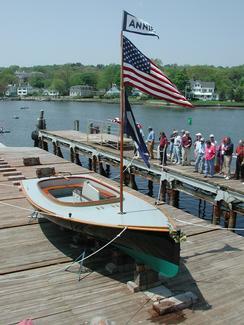 Acquired in 1931, Annie was the first boat in Mystic Seaport Museum’s collection, which now numbers more than 500 watercraft. Displayed outdoors on land for many years, she was partially rebuilt in 1950 and entirely rebuilt in 1968. 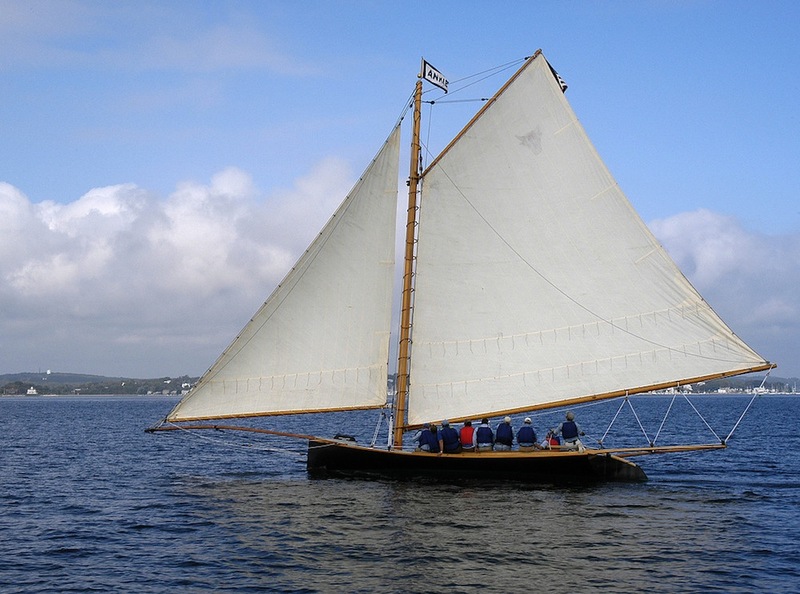 Annie underwent an extensive restoration in the early 2000s and was launched May 15, 2004. To restore Annie to her sailing condition, Mystic Seaport shipwrights used evidence from photographs and plans of other sandbaggers, as well as newly discovered evidence about Annie herself. In 1931, the model maker and author Charles G. Davis measured Annie. The Davis family eventually donated his papers to Mystic Seaport Museum, including his field notes. Using this information, Museum shipwrights installed a proper wide plank keel in place of the narrow keel installed in 1968. The rest of her “backbone,” including stem, sternpost and deadwood, also was replaced, as was the mast step that anchors the foot of her mast. 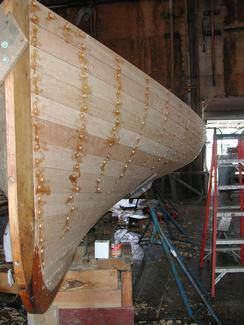 Using Davis’ notes, shipwrights built a more accurate centerboard trunk (the watertight box that holds the centerboard). With her restoration complete, little of her original material remains beyond the paneling on the centerboard trunk. However, in form and construction detail, Annie is very close to her condition after D.O. Richmond rebuilt her in 1902. Annie is now usually exhibited rigged and afloat, receiving yearly maintenance just as if she were still a competitive sailing yacht.